Enzymes are the chemical sparks of life. Without enzymes, many body processes could not function. A healthy digestion and the assimilation of food is dependent upon the body’s secretion of sufficient enzymes. Protease, amylase, lipase, cellulose and lactase all break down food into small components so the body can extract various nutrients from the food and use them to build tissue and maintain health. Enzymes are delicate substances and are easily damaged by heat and pressure (both are present in the manufacturing of tablets), therefore all Biocare enzyme products are supplied in capsules to maintain full potency. 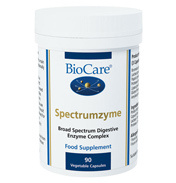 Biocare digestive enzymes are biologically active, are active over a wide pH, have improved activity over some animal derived enzymes and are assayed for the presence of yeast, moulds and microbial contaminants.